Sometimes called dwarf Gladioli, Gladiolus nanus are indeed a smaller growing variety than the better known varieties. They will not reach the dizzy heights of the modern florist types usually staying at around .5m and less. They are also known as Queen Wilhelmina Gladiolus. Excellent as cut flowers as well as for attracting bees and beneficial insects to the garden. They are very easy to grow in the garden, and in a well drained soil are hardy. The flowers are less formal than the large Gladiolus grandiflorus hybrids and work well in a cottage garden. Mirella – Apricot to orange flowers. Atom – Mid to deep red with white margins. 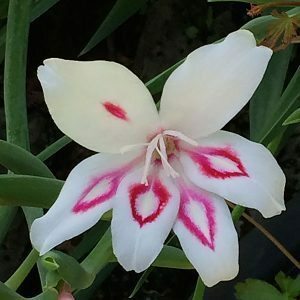 Nymph – Very attractive white flowers with deep hot pink heart shaped markings. Carine – Cream with small cerise markings. Nathalie – Salmon pink with deep pink to red markings. Much the same as others Gladiolus nanus like a sunny position and a well drained humus rich soil. Being lower growing they are also suitable for growing in a container, however we like them in the border in a mixed planting. Dry conditions or excellent drainage through winter. Although they are a hardy bulb we suggest that you monitor water during spring, in a dry season some extra watering will help with flower growth. In areas with poor drainage you are best to lift the bulbs during winter. Propagation by division is easy, best divided in late winter or early autumn.